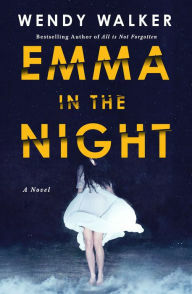 Emma in the Night by Wendy Walker is a highly recommended psychological thriller/mystery. On one night both of the Tanner sisters disappeared. At that time Emma was seventeen and Cass fifteen. Now three years have passed and Cass has returned home, without Emma, and she is sharing an incredible story of what happened and begging her family, the police, FBI, etc. to find Emma. She says that three years ago the two girls were picked up from a beach on Long Island Sound by a couple who wanted to help Emma, who was pregnant. They were both subsequently held on a mysterious island in Maine and the couple took Emma's child as their own. Cass escaped and now she wants them to find the island where she was held and find Emma. It's a bit more complicated than this because the two girls came from a dysfunctional family. Cass calls their mother, Judy, Mrs. Martin and Mrs. Martin is a classic example of Narcissistic personality disorder. The FBI forensic psychiatrist, Dr. Abby Winter, knows about Narcissistic parents and identified Judy Martin as such three years ago when her girls were missing and she became a minor celebrity. She's back on the case with Special Agent Leo Strauss. It seems that Cass may be leaving things unsaid in her many interviews, trusting that Abby will be able to figure it all out, while making sure Mrs. Martin hears every word. Chapters alternate between the point of view of Cass or Abby. Cass relates privately, to the reader, the story of her family, specifically her mother, and how Mrs. Martin's narcissism has poisoned her relationships and her choices have resulted in unstable parental support and put her daughters in compromising situations. Dr. Abby Winter has her own struggles and understands Narcissistic personalities, she is determined to uncover the clues and hints that she believes Cass is so carefully revealing to her. The writing is good and Walker slowly reveals the girls background with their mother along with little clues about what may have happened. Cass's story is very compelling, especially because you know she is leaving something unsaid, that she has a plan, but you really don't have a clue what it could be. The character development is well done. Both Cass and Abby are complicated characters and Walker manages to capture this part of their personalities while exposing why they exhibit some of their traits. It all combines into a narrative that will hold your attention. There were drawbacks. Clues were slow to come in Cass's interviews and the ending wasn't quite worth the wait for me. Additionally, parts of the narrative became too repetitious. This is almost a partial study of Narcissistic personality disorder in all of the background stories of Judy's behavior - the abuse heaped upon the girls because of her personality disorder and the men she married. Second is the girls behavior and reactions to everything. We hear almost too much of their past - what they were putting up with, doing, and fighting about - along with Cass's interviews. Solid 3.5 rounded up.